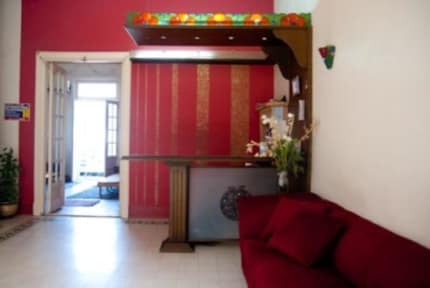 When in Cairo as a budget traveller, Meramees Hostel is the best place to stay! They eased all my anxieties about traveling alone to Egypt – from the minute I left the airport all the way to the minute I took off. They even had affordable planned itineraries out for easy trips in and out of Cairo. Everything was very clean and wifi was amazing! My stay couldn't be better but it was because of the staff (Migo, Ahmed, Youssef, Tallat and especially Ramy!) made Cairo unforgettable. Def recommend! I thought this place had an amazing atmosphere the people are wonderful! Highly encourage anybody staying in Cairo to stay at the Meramees! It’s super cheap and you meet many new people and they are great at helping you fill your schedule with great places to go! The location cannot be better, it’s a nice 10 mins walking to the Egyptian museum and there are many really cheap and tasty options around. The hostel is very clean and safe. I spent a total of 3 nights here, although initially I was only supposed to stay 1 night, I left my other hostel in Giza to come back here. The building is super quiet and the beds are really good, it’s the only place I got rest during my 10 day trip in Egypt. Also, the best breakfast I’ve had at a hostel. 10/10. This hostel is very highly recommended. Rooms were very spacious and very clean. There were cleaners that always made sure the bathrooms/toilets and hallways were cleaned. The hostel also provided a good, sufficient breakfast every morning which was definitely a highlight. Staff were kind friendly and they would help you organise or plan trips just to make your trip to Egypt enjoyable and comfortable! A spontaneous trip for my bday and was told about this hostel by a friend who has been here before. I was connected with the owner Ahmed before arrival and told him how long I was in Egypt. He had an airport pick-up for me waiting. Once I arrived at about 12AM, Ahmed greeted me personally and had an entire itinerary for Egypt ready with a fair price with tours that are must see. He even checked up on me throughout the trip. Ahmed got me a surprise bday gift too! Great staff that helped me a lot! Amazing staff, really helpful and kind. Good location and breakfasts. Friendly staffs, nice,big, clean room & bathroom. Stayed in Meramees for 3 nights. Good breakfast, great falafel :) - had breakfast once during our 3 night stay because of our 7:30 am schedule & their bf starts @ 8:30 am. Staffs are pushy to sell tours. Bought the arrival pick up service. Taxi condition was really poor. Read the reviews prior to coming to Cairo WIFI didn't work from room # 511 & 512 -- as many other reviewers reported. WE WILL STAY IN OTHER HOSTEL IN OUR NEXT VISIT.